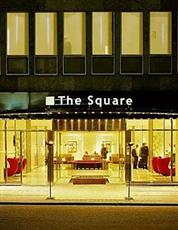 Square Hotel Copenhagen is situated near the historic district in the city, near Hall Square, Stoget and Tivoli Garden. There are numerous restaurants and eateries situated in the local area near the hotel. A variety of shopping venues is located not far away. Entertainment venues are available in the local area. Central Station is located not far from Square Hotel Copenhagen. Copenhagen Airport is located within a short drive of the hotel property. Secured parking is available near the hotel for the convenience of guests with cars. Guestrooms at Square Hotel Copenhagen feature amenities such as direct dial telephones, mini-bars, pay movies, alarm clocks, air conditioning and Internet access. Many rooms offer Town Hall Square views. There are 192 well equipped guestrooms at the hotel. Suites are also available. Guests of Square Hotel Copenhagen will be treated to such services and amenities as a daily breakfast, meeting and banquet rooms, safety deposit boxes, bar/pub, laundry services, 24 hour front desk, room service and Internet access.